A large weather system has explosively intensified off the CA/OR coast and is barreling towards the Northwest as a potent cyclone. This may be a big windstorm folks. The National Weather Service in Seattle has issued a High Wind Warning for most of Western Washington. 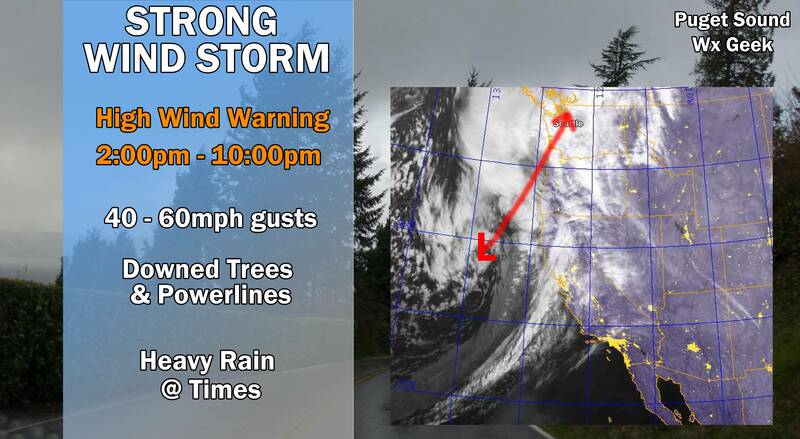 Damaging winds of 60mph can bring down trees and power-lines. However, there is great uncertainty in the track of this storm. If the storm meanders to the west or weakens slightly there is a chance that we may not see high winds along the Puget Sound. Even with this uncertainty, please prepare for a strong windstorm this afternoon and evening. The peak winds appears to be after 5 p.m.